This well-to-do district of west London owes its name to the family of Hugh Grosvenor, the 7th Duke of Westminster and owner of the Grosvenor Estate, the land upon which Belgravia is located. The country estate of the duke’s family – the Grosvenors – is known as Eaton Hall and it lies just to the south of Chester. Various names related to the estate appear on the London map. Among them is Belgravia. Belgravia take its name from the tiny village of Belgrave which lies within the estate’s boundary (the word Belgrave, incidentally, comes from the Old French for “beautiful wood”). The London residential area now known as Belgravia, meanwhile, was formerly known as Five Fields and used for grazing. The Westbourne River meandered through it, crossed by “Bloody Bridge”, so-called because it was a known haunt of robbers. 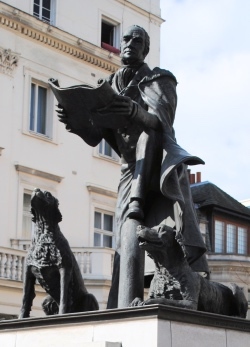 It later became the site of market gardens and houses began to appear in the area following King George III’s move to what was then Buckingham House but development of the area didn’t begin in earnest until the 1820s when Robert Grosvenor, later the first Marquess of Westminster (pictured here in a statue in Belgrave Square), began developing the estate with the aid of builder Thomas Cubitt. Designed with Belgrave Square at its centre, the new development immediately became associated with the more affluent end of society, a connection which continues to this day. As well as Belgrave Square, the district, which straddles both the City of Westminster and the Royal Borough of Kensington and Chelsea, includes Eaton, Chester and Lowndes Squares (the first two names associated with the duke’s country estate; the third named after William Lowndes, a politician and Secretary to the Treasury under King William III and Queen Anne. Palatial terraced houses aside, landmarks include the Grade II-listed St Peter’s Church, located at the east end of Eaton Square, which was first built in the 1820s and rebuilt in the 1830s. The area is also home to numerous embassies and consulates including those of Norway, Spain, Malaysia and Egypt, and, in keeping with the international feel, also boasts several statues of notable foreigners including Simon Bolivar and Christopher Columbus. Famous residents have included former Prime Ministers Stanley Baldwin, Neville Chamberlain and Margaret Thatcher (the first two lived in Eaton Square; Thatcher in Chester Square), Louis Mountbatten, who lived in Wilton Crescent, and Alfred, Lord Tennyson, who lived in Upper Belgrave Street, as did Lord Lucan who mysteriously disappeared in 1974 after his children’s nanny was found murdered. 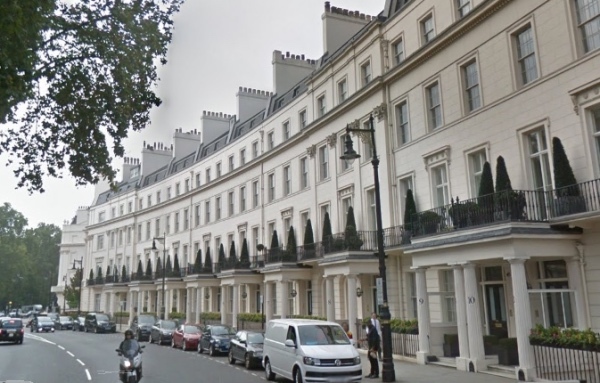 PICTURES: Top – Terraced homes in Grosvenor Crescent, which runs off Belgrave Square (Google Maps); Right – Statue of Lord Robert Grosvenor, first Marquess of Westminster (David Adams).